- How should I structure my customer success team? - Who should customer success report to in the organisation? - Does X role belong in customer success or somewhere else? - What responsibilities should a customer success manager look after? As the customer success field evolves, you may get a different answer for each of these questions, depending on who you speak to. My goal is not to provide a definitive structure for every customer success team. The table below is my attempt to pull together all the potential roles I’ve seen across different companies. It’s up to you to decide which functions are needed in your company and where exactly they could sit. As a reference, this post on the pros and cons of different team structure is useful. 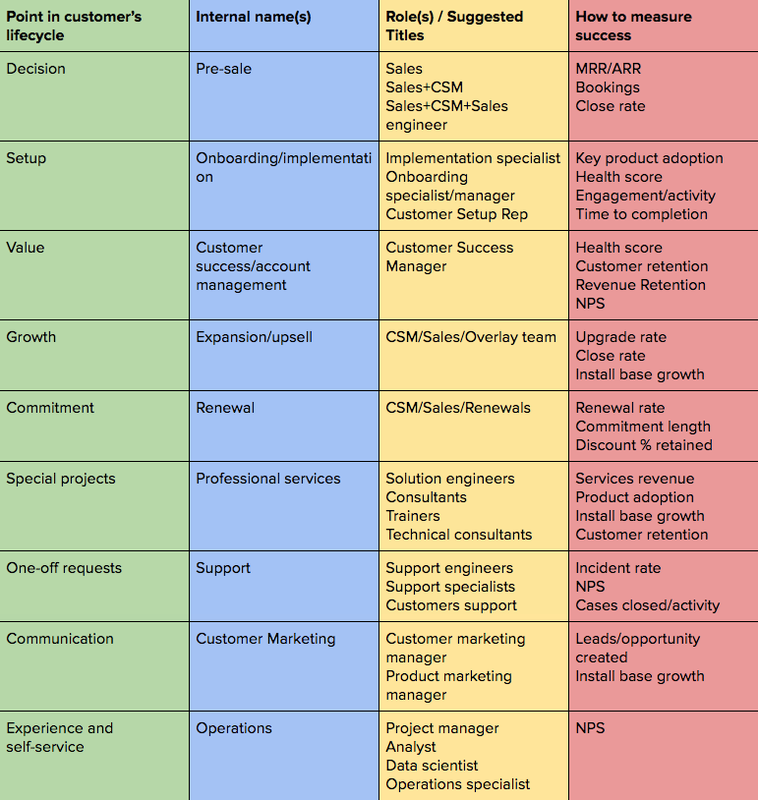 In the table below I’ve outlined a comprehensive list of roles to meet your customer at each stage in their lifecycle. By no means do you need to have a specific role that looks after each one. In a mature large CS org you might need dedicated roles for each while in a startup we often find ourselves looking after a bit of customer support, running some reporting while managing a book of business. The important point is that you are thinking of the varied needs that a customer might have at each stage and aligning different resources to address them. I’ve been personally guilty of this one. It’s very tempting to design your team structure around what’s easiest for reporting structure and internal roles. If you have the luxury of looking at this with a fresh set of eyes it’s much more beneficial to take an “outside-in” approach first. Define your customer success personas and map out the varied paths they make in their lifecycle. The customer doesn’t care where they sit in your org, when they need something all they care about is that you are aligned internally to solve it. Place your CS org closest to the group that allows the most flexibility to get things done for the customer. If CS needs to report to sales because they have access to operations and legal people who can solve customer challenges faster then put them there. Over time this structure can change and develop as you scale and become more mature.